How to nail the sporty stripe trousers trend. If you’re around my age and you’ve spotted the uber chic sporty stripe trousers trend which has been bubbling under the past few seasons and burst out into the mainstream for this upcoming SS18, you may well also be suffering from acute bad-taste-dressing memories. For me, back in the day, the sporty stripe trouser comes with awful flashbacks of red Adidas skinny tracky bottoms (with a flattering white side stripe natch) worn on freezing cold hockey pitches with absolutely no fashion points whatsoever… I mean none, nada, dim (for us welshies). So fast forward to today and why is this trend from way back in the 80’s suddenly gripping the nation and our high street? Well apart from the new slew of sporty stripe trousers coming at us in all sorts of uber comfy new synthetic fabrics (we’d never heard of lycra all those years ago). 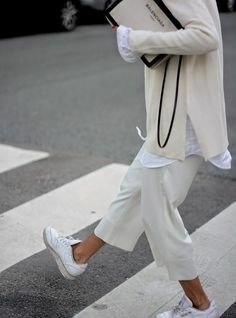 There’s also a double whammy trend situation going on where all things athleisure are now totally acceptable to wear day or night with no need to even put your foot over the threshold of a gym. But also the 80’s are back with a vengeance, and this time better. So it’s time to chuck all those old misconceptions about this much-vilified item away and start adopting it with love into our wardrobes. So the sporty stripe trouser can come in many a variant. There are the fab flared ones at Me + Em (above) for the perfect leg lengtheners (beware super shorties – you may need a little alteration not to look swamped). I’ve paired these with a sporty Me + Em half zip top and Marks & Spencer sneakers (gifted from a recent ad campaign with them). This style of bottoms looks great with an oversized knit by day or a silk shirt by night. You can also nab a more tailored pair which is great for the office. Then there’s also the jogger version (which I must admit does feel very close to those old red ones I remember – hence couldn’t do them in red). These cuties are also Me + EM (as is the cashmere hoodie); and with a sneaky little rolling of the hemline and the addition of a pair of L.K.Bennett heels, I’ve got a casual evening look ready to go… and nobody would know I’ve been lounging around the house binge watching This is Us all afternoon. Sporty stripe trousers… where to shop. So you can snap up sporty stripe trousers with full-on emblazoned colour blocking power stripes, or opt for a more subtle stripe in a similar hue to your bottoms. Me + Em seem to be nailing it on the SS18 offerings this season, although Baukjen and Zara have similarly great choices. 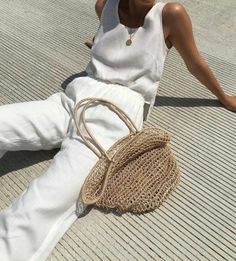 If the side stripe is a step too far for you, there are also plenty of palazzo pants out there which kind of tick the same loungewear vibe without the feisty stripe so take a peek at them. 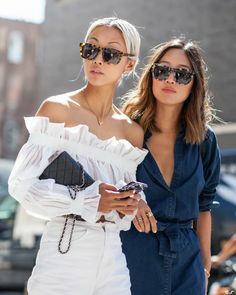 Everyone seems to be playing with this trend from high-end designer to the good old high street, so take a look around and definitely do some trying on before you buy. Hemlines are all over the place – Me + Em favour longer lengths while Zara has some neat, petite sizes too. Here are some of our faves out there right now. Click the images to shop. With thanks to Me + Em for the loan of the trousers for this shoot. I’ve added this post to the fab Not Dressed as Lamb #SaturdayShareLinkup by Catherine Summers – you can find loads of other great reads in one spot – pop over for a read. Previous Post Max Factor is back… and it’s good!